Delivering right amount of fuel: The function of the fuel injection system is to provide the right amount of fuel at the right moment and in a suitable condition for the combustion process. There must therefore be some form of measured fuel supply, a means of timing the delivery and the atomisation of the fuel. The injection of the fuel is achieved by the location of cams on a camshaft. This camshaft rotates at engine speed for a two-stroke engine and at half engine speed for a four-stroke. There are two basic systems in use, each of which employs a combination of mechanical and hydraulic operations. The most common system is the jerk pump; the other is the common rail. 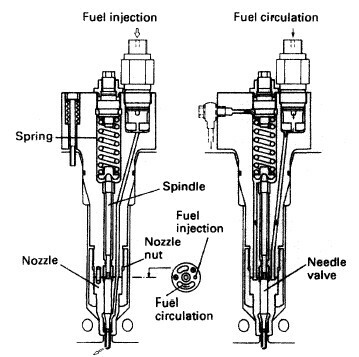 A typical fuel injector is shown in Figure , It can be seen to be two basic parts, the nozzle and the nozzle holder or body. The high-pressure fuel enters and travels down a passage in the body and then into a passage in the nozzle, ending finally in a chamber surrounding the needle valve. The needle valve is held closed on a mitred seat by an intermediate spindle and a spring in the injector body. The spring pressure, and hence the injector opening pressure, can be set by a compression nut which acts on the spring. The nozzle and injector body are manufactured as a matching pair and are accurately ground to give a good oil seal. The two are joined by a nozzle nut. The needle valve will open when the fuel pressure acting on the needle valve tapered face exerts a sufficient force to overcome the spring compression. The fuel then flows into a lower chamber and is forced out through a series of tiny holes. The small holes are sized and arranged to atomise, or break into tiny drops, all of the fuel oil, which will then readily burn. Once the injector pump or timing valve cuts off the high pressure fuel supply the needle valve will shut quickly under the spring compression force. All slow-speed two-stroke engines and many medium-speed fourstroke engines are now operated almost continuously on heavy fuel. A fuel circulating system is therefore necessary and this is usually arranged within the fuel injector. During injection the high-pressure fuel will open the circulation valve for injection to take place. When the engine is stopped the fuel booster pump supplies fuel which the circulation valve directs around the injector body. Older engine designs may have fuel injectors which are circulated with cooling water. 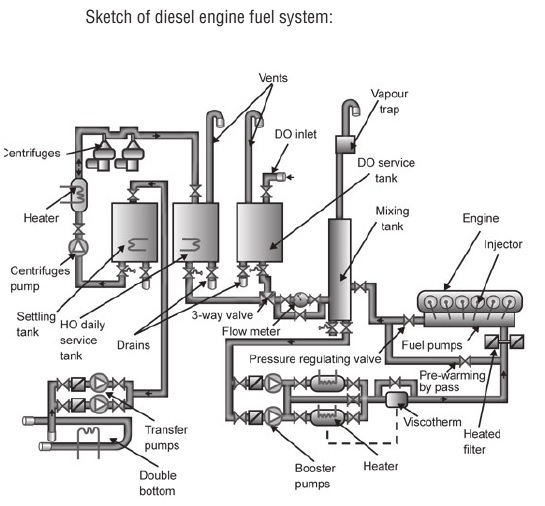 Brief explanation of how fuel system works in a marine diesel engine ? From the bunker tanks, fuel is transferred by the transfer pump to the settling tank, from the settling tank, fuel oil is purified to the service tank. From the service tank, the fuel oil is pumped through a pressurised fuel system to the engine. The fuel oil firstly passes through a set of cold filters to a set of fuel oil booster pumps, raising the fuel oil pressure to around 12 ­ 15 bar, delivering the fuel through a set of heaters and viscotherm, a set of fine filters then to the fuel rail and to the engine fuel pumps where the pressure is raised to around 250 ­ 300 bar for atomisation by the fuel injector. The heater in the system reduces the fuel oil viscosity in the system for efficient combustion. The temperature required will depend on the fuel oil quality which will vary, however the temperature should not exceed 150°C. The fine filter in the system is a stainless steel mesh to filter out particles larger than 50 microns, or less for smaller engines. Filters should be cleaned regularly. The density of fuel oil burned in a diesel engine is important because some fuels of different densities are not compatible and formation of heavy sludges can occur in tanks.